Tammy Iliou at the Greek Orthodox Community Centre for the funding announcement. PHOTO: Vicki Jones Photography. 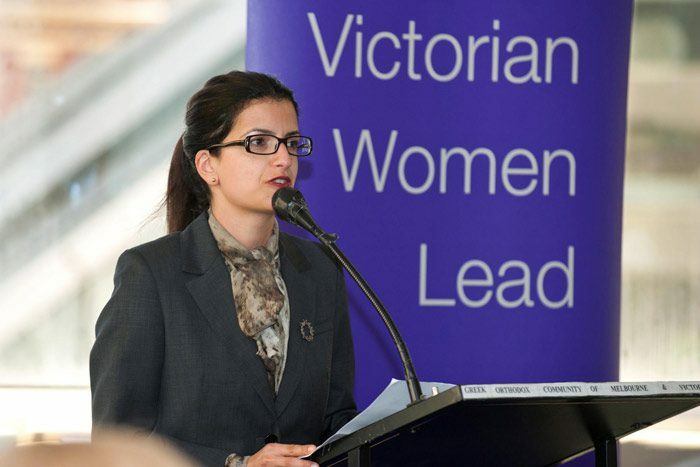 When Tammy Iliou was elected to the board of the Greek Orthodox Community of Melbourne and Victoria (GOCMV), aged 34, she looked around for a network of women on ethnic community boards for guidance. She was surprised to find there was no such thing. Research shows that when women occupy leadership positions there are significant economic, social and community benefits. But this week, the GOCMV received state funding to establish a Cross-Cultural Women’s Leaderships Network, linking women who hold senior and leadership positions within their respective communities. At the funding announcement at the Greek Orthodox Community Centre last week, Ms Iliou said her initial consultations with other women showed there was a need for the network. “The Greek community is an established community, so what is it like for women in newer migrant communities?” she asked. She said, being one of only three women on the GOCMV board, and the first female co-chair of the Antipodes Festival, prompted her to think about the lack of women in senior positions in other migrant groups. “What’s interesting is that we all come from different cultural and religious backgrounds, but we all face the same issues,” she told Neos Kosmos. The network, which will look at mentorship and encouraging the next generation of young women, will be launched with a forum in May next year. The GOCMV is one of 24 Victorian groups to share in $350,000 for the latest round of the Brumby government’s Women’s Leadership Grants. Minister for Women’s Affairs Maxine Morand said the grants would focus on encouraging women with a culturally diverse background, as well as women from regional Victoria, to take on leadership roles. “Research shows that when women occupy leadership positions there are significant economic, social and community benefits,” she said. Other recipients included Arabic Welfare Incorporated, African Leadership Learning and Advocacy Group, and the One Hundred Percent Project. Penelope Kypurus is an organisational psychologist with the One Hundred Percent Project, who were awarded $15,000 for research into the lack of women on boards and executive teams. Ms Kypurus, who wrote a Masters thesis on women in senior roles in large Australian corporations, said there was a real need to encourage companies to increase the number of women in executive roles. “I thought we’d won this war, but obviously we haven’t,” she said. And she said there were even fewer Greek women in boards than there were in the wider community. “Not only are women discriminated against, there’s cultural discrimination,” she said.